Java Interview Question is here to help you through the INTERVIEW process, teaching you what you need to know and enabling you to perform at your very best. I've coached and interviewed hundreds of software engineers. The result is this book. These interview questions are real; they are not pulled out of computer science textbooks. They reflect what's truly being asked at the top companies, so that you can be as prepared as possible. Cracking the Coding Interview makes a lot easier! it gives you the interview preparation you need to get the top software developer jobs. 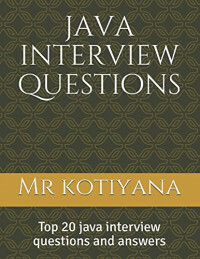 We are also sharing 20 java interview Programming questions; these questions are frequently asked by the recruiters. WHAT'S INSIDE? - Programming Basics -20 programming interview questions, ranging from the basics to the trickiest algorithm problems. -Steps required to preparing for an interview at big companies like Google, Apple or Microsoft. -Skills you must have to become professional programmer. -Important data structures and algorithms required for the interview. -Learn how to become a great programmer! -Coding interview tips. -Programming Quotes!